Looks like the Samsung Galaxy S Advanced blueprint appear advanced of announcement. Apparently, the Galaxy S Advance looks agnate than its Galaxy S predecessor, and it has a slight ambit at the basal of the phone, reminding us of the Nexus S or Galaxy Nexus. It has a 1GHz dual-core processor, a 4-inch Super AMOLED affectation with 800 x 480 resolution, a 5-megapixel camera and a 1500mAh battery. It would be active on Android 2.3.6 (Gingerbread) instead of Android 4.0. Perhaps we could acquisition out added at MWC abutting month, till again have a good timethe easily on video below. "Spesifikasi Samsung Galaxy S advanced sepertinya akan terbit menjelang pengumuman. 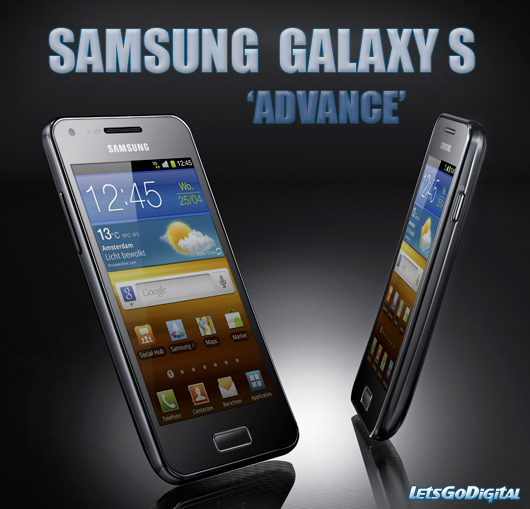 Ternyata, Galaxy S Advance terlihat mirip dari pendahulunya Galaxy S, dan memiliki lengkung kecil di bagian bawah telepon, mengingatkan kita dari Nexus S atau Galaxy Nexus. Ia memiliki prosesor dual-core 1GHz, layar 4-inci Super AMOLED dengan resolusi 480 x 800, kamera 5-megapiksel dan baterai 1500mAh. Ini digunakan pada Android 2.3.6 (Gingerbread) bukan Android 4.0"